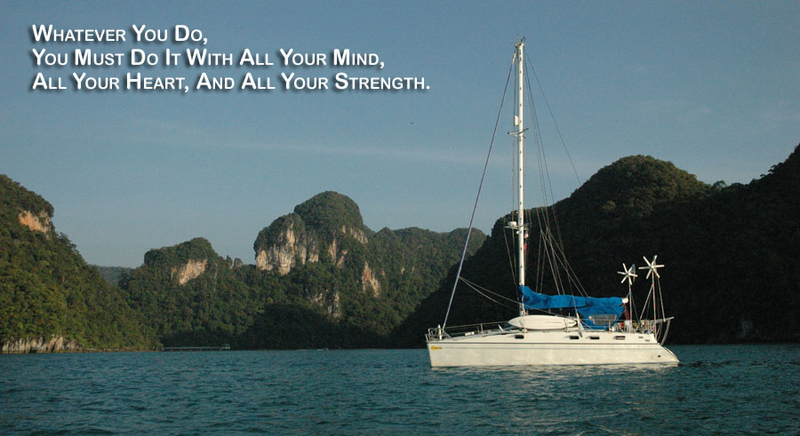 POSITIVE GUIDEPOSTS FOR SAILING ON GOD'S OCEAN OF LOVE - POSITIVE THINKING DOCTOR - DAVID J. ABBOTT M.D. No matter how fast you sail, if it's in the wrong direction, you will never reach your dreams. You need guideposts to provide direction as you sail on God's ocean of love. Guideposts help you navigate around the shoals and escape the tsunamis of life. 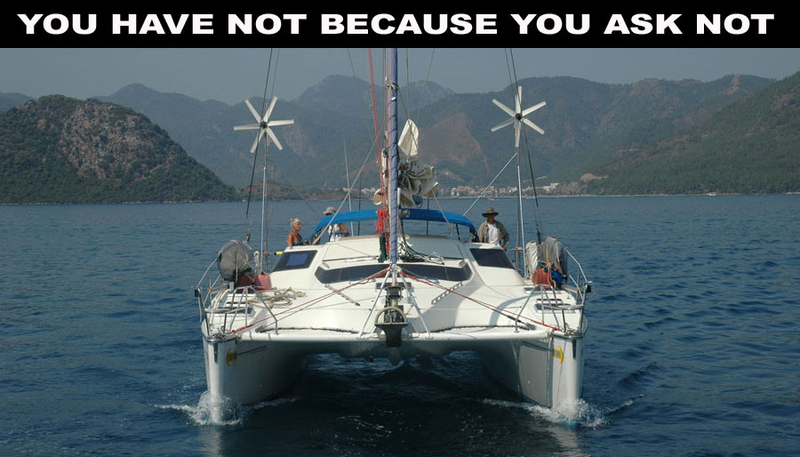 I spent eleven years sailing around the world on my catamaran, Exit Only, and accurate sailing directions kept me safe during the circumnavigation. I didn't just set off and hope for the best. 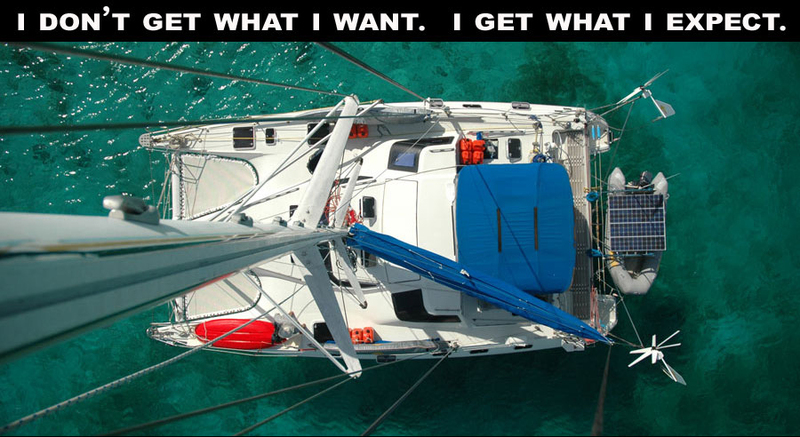 I took my sailing directions with me, and I took those directions seriously. 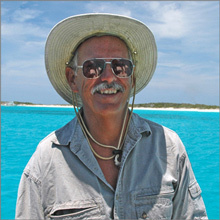 I had charts and guides that identified the rocks, reefs, and shoals that could have destroyed my yacht. 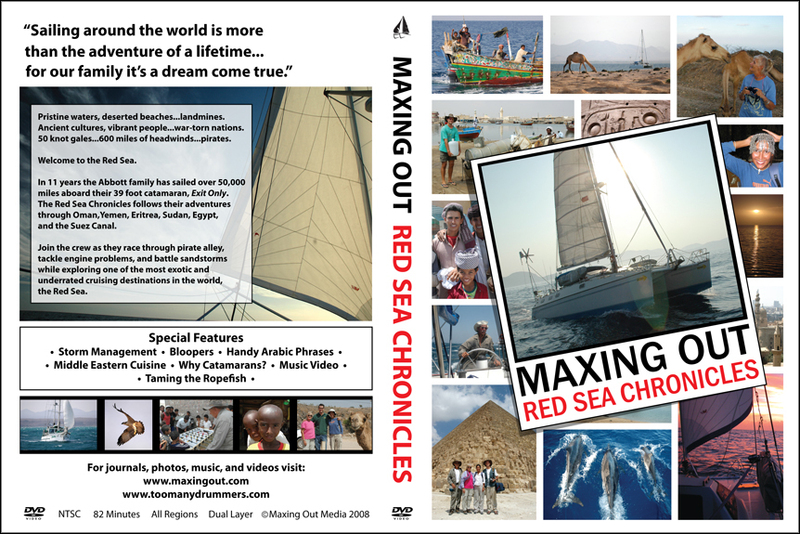 Sailing directions were guideposts that kept me and my sailing dreams alive. When you sail on God's ocean of love, you need positive directions to have a safe voyage. You need to know the location of reefs and rocks that can destroy you and sink your dreams. You need to know about the storms and the winds you will encounter along the way. 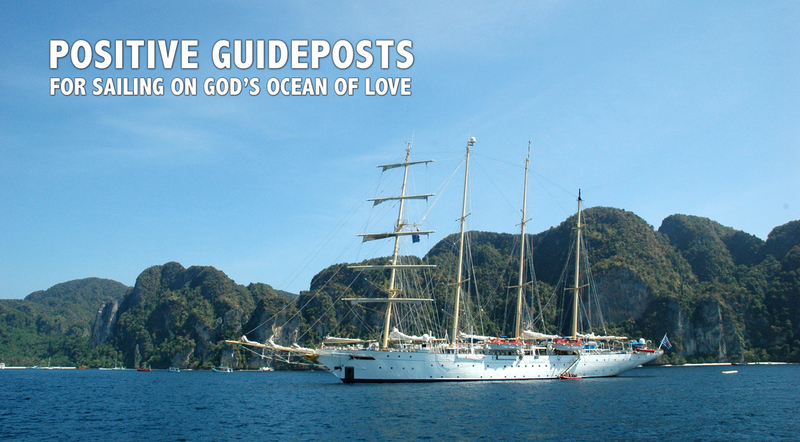 Positive guideposts are your sailing directions as you navigate on the ocean of God's love. Positive guideposts get you headed in the right direction, and guarantee you will have a safe trip. 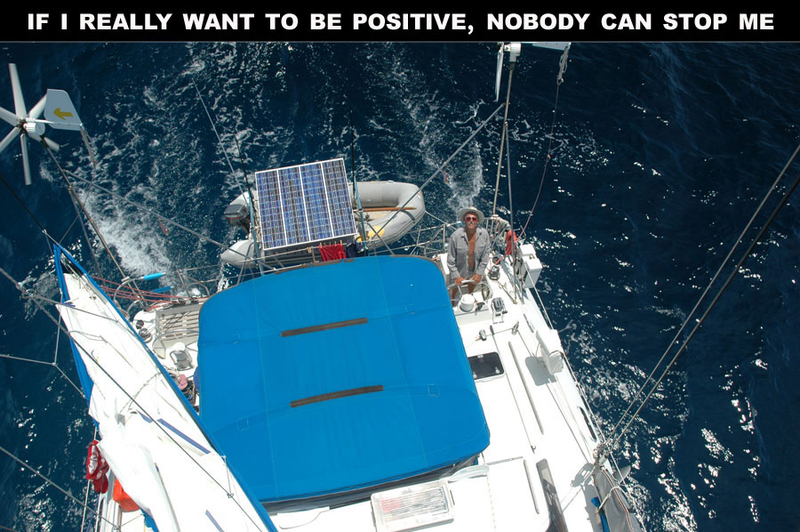 Check out these positive guideposts and have a great voyage. 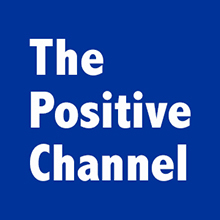 The Positive Thinking Network has 600 websites with more than one million pages and podcasts downloaded each month. 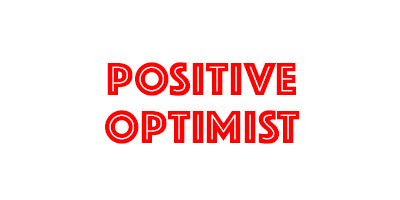 The Positive Thinking Network depends on donations and ebook sales to finance our operations. 100% of the proceeds of ebook sales go directly to support the mission of the Positive Thinking Network. When you download an ebook, you become part of the Positive Thinking Network, and your purchase makes a difference in the lives of people in 196 countries. 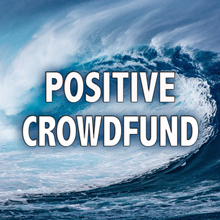 Join Positive Crowdfund and become part of something great. You will be doing your part to make a difference in the world. Dare to call God your Father, and build your life on the foundation of his love. Spiritual birth happens the moment you open your heart to God’s love and dare to call him Father. Learn to think the way that God thinks. Although it might seem presumptuous to believe that humans can actually think the thoughts of God, we must always remember that God created us in his image, and He gave us the ability to think and feel. It's reasonable to assume that God must have designed our minds to function best when we fill our minds with certain types of thoughts. It's also reasonable to assume that God designed our hearts to function best when certain types of emotions fill our heart. The creator of the universe actually did have a plan for our hearts and minds. When your heart is full of emotions consistent with His love, your emotions are healthy, and they are exactly the way God means for them to be. When you think the way that God thinks, your heart and mind are full of God's love. Your thoughts are positive and your emotions are healthy. They are exactly the way God means for them to be. There is no mystery here. 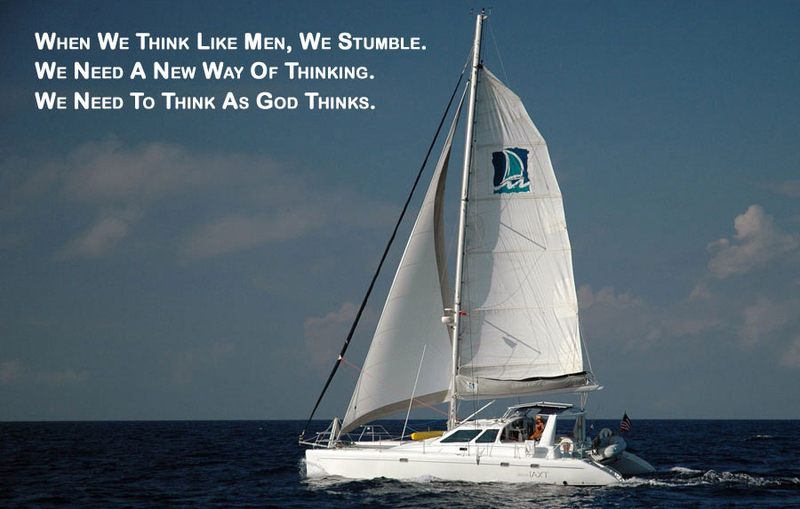 You must simply start thinking the way that God thinks. Get in agreement with God. You need to understand how God thinks so you can get in agreement with him. God thinks abundance. Jesus said that he had come so that you might have life and have it more abundantly. God created the world and everything in it. What you need is no big deal to God. Supplying your needs won’t break his bank or bankrupt his kingdom. God enjoys giving you good things. His plan is to fill your cup with blessings until it overflows. God thinks possibility. All things are possible when you think the way God thinks. God is the God of possibility, and there is no limit to how good your life can become when you think the way God thinks. God thinks positive. The most positive force in the universe is God’s love. It changes the way you think and feel making you into a positive person. God thinks positive expectations. When you get into agreement with God, your expectations change. Impossible becomes possible, and scarcity becomes abundance. God has a powerful positive plan for your life. God expects good things to happen in your life when you think the way He thinks. God thinks forgiveness. God forgives you for the wrong things that you have done. He not only wipes the slate clean, He also throws the slate away. 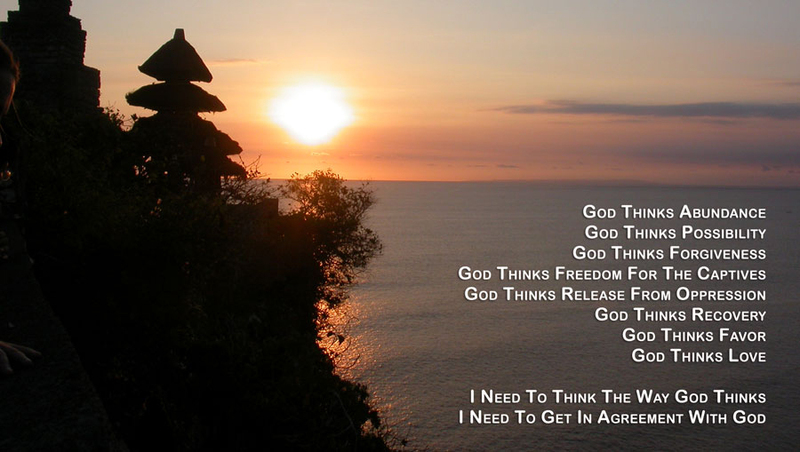 God thinks freedom for the captives. Jesus came to set the prisoners free. The chains of lack and limitation fall off when you think the way God thinks. God thinks release from oppression. Jesus came to liberate you from all forms of oppression. Economic, spiritual, chemical, and psychological dependencies disappear when you think the way God thinks. God thinks recovery of what has been lost. The blind receive their sight. What the world destroys and takes away, God recovers and restores. God thinks favor. He bestows his blessings on all who get in agreement with him. He opens the windows of heaven, and blessings fall all around. God thinks good news. God has no dark side. He is on our side, and is in it with us for the long haul. All of God’s thoughts are good news. When you become silent and listen for God’s voice, you hear his positive message of love. You can trust God. If you do your part, God will do his. When you get in agreement with him, then God starts working miracles in your life. Have a zero ambivalence relationship with yourself and with God. Zero ambivalence means that your mind, heart, and will are all congruent and committed to moving together in a non-ambivalent fashion to achieve a worthwhile objective. All three components of your personality ( your heart, mind, and will) are heading in the same direction and working together to achieve the same purpose. The three parts that create your personality are your mind, heart and will. If those three components of who you are get in agreement, they are congruent. They all want the same thing, they are all headed in the same direction, and they are all working together toward the same objective. If your will, mind, and heart are heading in different directions, then you will be pulled apart and become dysfunctional because you are not in agreement with yourself. You must be congruent if you want good things to happen. That's why Jesus said that we need to love God with all our heart, all our mind, and all our strength. He was stating a simple truth. In our relationship with God, we must be congruent, or it will not work. If your heart wants one thing and your mind wants another, you are doomed to a life of failure and frustration. When you have zero ambivalence, you are in agreement with yourself, and you are in agreement with God. Develop positive expectations. You don't get what you want, you get what you expect. 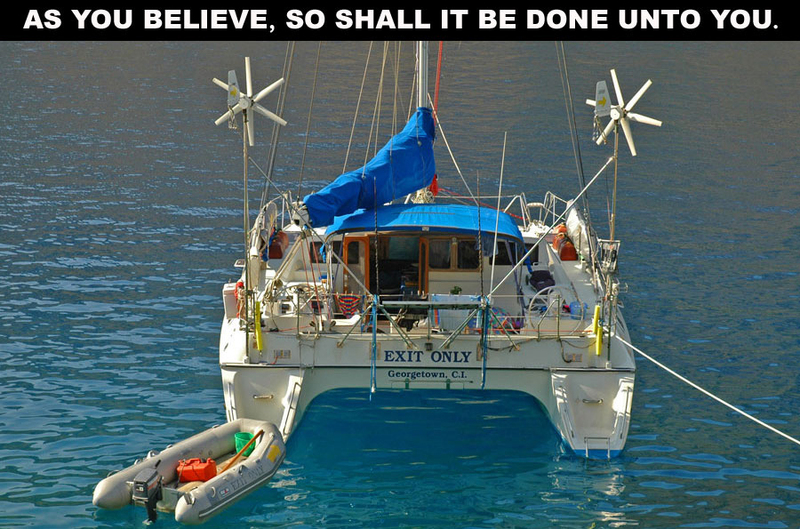 As you believe, so shall it be done unto you. Jesus created a world ruled by your expectations. You don't get what you want. You get what you expect. It doesn't matter if your expectations are positive or negative, you will get what you expect. Jesus understood the laws of the moral universe because he created those laws. He knew how things work. When Jesus tells us how to live, he isn't just giving good advice. He is stating in absolute and unequivocal terms the way he made things work. That's why he said, "As you believe, so shall it be done unto you." Jesus created a universe in which expectations rule. It doesn't matter that much what you want. It's what you expect that counts. Jesus said, "Ask and you will receive, seek and you will find, knock and the door will be opened." I am to ask expectantly, seek expectantly, and knock expectantly. Jesus came to change our expectations. He taught that positive expectations are the foundation for a positive life. Never quit. It's never over until God says it's over. For as long as you are alive, you must work on your dreams. The day you quit working is the day you start to die. You will be dead for a long time, and there is no need to hasten the process by dying before your time. Life is short, and death is long, and you should never quit until you die. There is only time time when you should quit. When what you are doing obviously isn't working, it's time to try a new strategy. You may be doing the right thing, but your timing is off. You may be doing the wrong thing, but your timing is right. If you are doing the wrong thing, or if your timing is off, you should stop what you are doing and try something new. Failure is not a signal to quit. Failure is a signal to modify your timing or strategy. Eventually, you will make the proper adjustments, and your dreams will come true. You must never quit working on your dreams until God says it's over.. Achieve excellence in at least one area of your life. Select an area of excellence which you develop and give to the world. Whether you realize it or not, God embedded excellence into the core of your being. From the top of your head to the tip of your miraculous big toe, you are excellent through and through. God has a plan for your life custom designed for just you, and that plan has excellence stamped all over it. If you have been beaten down into mediocrity, and if you feel there's no reason for hope, it's time for you to listen up. You have the ability to achieve excellence in at least one area of your life, and that's just the beginning. There is no limit to how good your life can become when you align yourself with God's master plan. Don't place limits on worthwhile objectives until you do your utmost to make them happen. Limiting thoughts are a disguised form of negation. They are a way that you say no to life while pretending that life is saying no to you. Limitations are plausible self-deceptions. They are prefabricated excuses for every failure to be what you want to be and do what you want to do. No one blames you for being held back by all the limitations that you have adopted. Limitations are a subtle form of negativity that is socially acceptable. They don't have a bad sound or smell. It even has the appearance of maturity to not struggle with reality and to accept the limitations that appear to be present in the world. When you face a challenge, you write a script of limitations and possibilities based upon your beliefs about yourself. Inside your mind is a personalized collection of limiting beliefs that tell you everything you cannot do. Your limiting beliefs create confusion, and it's easy to attribute your limitations to your world rather than to yourself. There is no reason to place limits on any worthwhile object before you try to make it happen. Limiting beliefs are a choice, and you should choose to not have any. Respect the laws of the moral universe. The moral universe grinds slow, but it grinds sure. When you are in agreement with the laws of the moral universe, you prosper. When you violate the laws of the moral universe, your life becomes harder than it needs to be. The moral universe is relentless, and it takes sides on the choices you make. It gives you either rewards or consequences. Rewards are positive and empowering. Consequences are negative and destructive. You have a free will, and have the right to break every law in the moral universe. Nevertheless, breaking those laws is an exercise in self-destruction. Every law that you break will eventually break you. That's 100% guaranteed. It will happen. Learn the laws of the moral universe, and use them in a positive manner. You will prosper, and there will be no limit to how good your life will become. Be transformed by the renewing of your mind. Change your life by changing the way you think. The mind is the door through which you enter the world of positive change. That's why the Bible says, "Be transformed by the renewing of your mind." In order to have a new life, you need a new way of thinking. You can change who you are by changing what you put into your mind. When you change your mind, you change your life. This law of change never fails. Although the wheel of change turns slowly, it always turns in the direction of what you put into your mind. You must fill your mind with positive thoughts so your life moves in a positive direction. Everything you put into your mind is important because it changes who you are. When you put in good things, your life improves. When you put in bad things, your life becomes worse. There are no exceptions to this law. Positive transformation is not an accident; it's something you do on purpose. You become a positive person by putting positive things into your mind. Trying to change your life by changing your image is a waste of time and is doing things backwards. It will not work. You change your life by changing the way you think. At the moment of change there is a shift in your beliefs about who you are and what you can do. Whatever changes you make always happen in an instant, and they happen first in your mind. If you are having a hard time bringing about positive change, you need to examine your beliefs. A key belief is preventing you from change. If you alter that belief, you arrive at the instant where change is possible. Do not talk yourself into believing that change is impossible. Positive change is something that you already know how to do. The size of the change is irrelevant. Whether changes are large or small, they still happen in an instant, and they happen first in your mind. Fill Your Mind With Good Things. 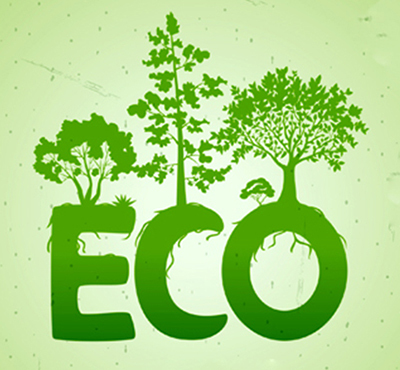 Your mind is not a dumpster for the toxic waste of the twenty-first century. You don't want to allow negative thoughts and limitations to fill your mind. The way you get a positive mind is to fill it with positive things. Use positive affirmations to change the way you feel. The inner emotional skeptic isn’t interested in logic; it’s more susceptible to the power of repetition than it is to the power of reason. If you repeat anything enough times, the inner skeptic slowly has a change of heart, and it changes the way you feel. God’s love is the most powerful force in the universe, and when his love floods your heart and mind, it heals your damaged emotions. Affirmations help you focus on God’s love and practice his healing presence. God's love changes the way I think and feel. His love washes the toxic waste out of my mind and gives me a clean mind and a pure heart. My old way of thinking and feeling is gone. My mistakes and failures are cast into God's ocean of love. For the first time in my life, I dare to call God my Father and live as one of his children. God's love heals my damaged emotions, and my negative feelings and guilt are washed away in a tidal wave of love. Maximize the power of God's love by sending it out to other people. People suffering from depression and emotional problems have an unhealthy inward focus. Their inward focus is the recipe for self-destruction, especially when that focus is negative and critical. The cure for depression and many emotional problems is an outward focus. They need to stop relentlessly ruminating over their problems and to start sending love to other people. The more love you pass on, the more that comes your way. The less you send to others, the less that flows to you. People don’t realize that when they send only a trickle of love to others, only a trickle comes back to them from God. What goes around comes around. God’s plans are elegant in their simplicity. Even a child can understand them. No one should ever die of spiritual thirst in God’s world; there’s plenty of love for everyone. Say good-bye to guilt and hello to God's love. God has a plan for your life that is better than anything you can imagine. There is no limit to how good your life can become when you max out on the power of His love. Use the power of praise to remind yourself of God's presence and power. Praise recognizes and reminds you of the power and presence of God working in your life at specific times and places. Praise is an affirmation of your trust in God and gives Him the opportunity to demonstrate his presence and power in a major way. Praise is not about feelings. It's about facts that reflect the power and presence of God. Do not confuse praise with emotion. Praise is not emotion, but words of praise often are full of emotion. Praise is an affirmation of the power and presence of God in your life. Emotion is how you feel because of what God is doing on your behalf. Praise focuses on facts. Emotion focuses on feelings. Don't place your faith in your feelings, because feelings change. Place your faith in God who is working in specific and concrete ways to make your life into something good. Praise is a recognition of God's specific actions on your behalf. It reminds you that you have a personal relationship with God, and that when you get in agreement with Him, amazing things start to happen. Praise recognizes what God has done in the past. When your eyes of praise look into the past, you see the hand of God working things out. God made a way when it appeared that there was no way. God exchanged your impossibilities for His possibilities. Praise recognizes what God is doing in the present. When your eyes of praise look at the present, you see what God is doing in your life right now. You see a here and now God who has a positive plan. When you get in agreement with Him, He takes you to places far beyond your early limited dreams. Praise recognizes what God will do for you in the future. When your eyes of praise look into the future, you see God leading the way and showing you where to take the next step. Praise connects you with God and is part of your conversation with God. You talk to God and thank Him for all that He is doing. Praise a major part of your relationship with God. It's your personal conversation with the Father - spirit to Spirit - heart to Heart. It reminds you of God's presence and power. It's spiritual glue that strengthens your connection with God. I suspect that God enjoys our praise because it can only come from hearts that love and trust Him. Words of praise confirm that we love God with all our heart, all our mind, and all our strength. I also suspect that praise is more for us than it is for God. God doesn't have an ego problem that needs to be propped up with words of praise. On the other hand, we need to speak words of praise. The more we praise, the more we affirm God's presence and power. The more we praise, the more we see God at work in the past. The more we praise, the more we see God at work in a personal way in the present. The more we praise, the more we trust God to lead us into the future. The more we praise, the more faith wells up in our heart and mind. Praise is more than just words. It creates an atmosphere in which God manifests his presence and power in miraculous ways. When Paul and Silas were locked up in prison, they sang songs of praise so loud that all the other prisoners could hear how God was working in their lives. They had just been beaten, they were in chains, and their legs were in stocks. They should have been in the dungeon of despair. Instead, they sang words of praise to the God who was rocking their world. It wasn't long until God sent an earthquake and released them from their stocks and chains. The message is clear. Songs and words of praise break the chains of lack, limitation, captivity and addiction. When you are down, you are never out if you sing words of praise. God honors praise by demonstrating his power as you face your biggest challenges. In days of King Jehoshaphat, a coalition of armies assembled to attack Jerusalem. The situation appeared grave and the people were afraid. 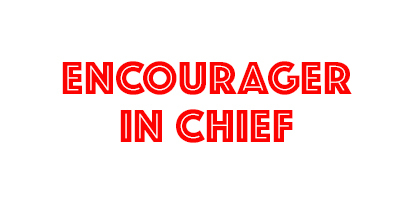 In the midst of the terror, the word of the Lord came to Jehoshaphat with the following message, "Do not be afraid or be discouraged because of this vast army. For the battle is not yours, but God's. You will not have to fight this battle. Take up your positions; stand firm and see the deliverance the Lord will give you." The next day Jehoshaphat appointed men to go in front of the army of Israel and sing praises to God as they went. In the eyes of the world, this was a suicide mission. People singing songs of praise on the front lines between two armies prepared for combat. But eyes of praise saw a completely different picture. They could see that the battle was the Lord's, and they sang songs that recognized God's presence and power. When the foreign armies heard the songs of praise, they began fighting among themselves, and they fled the battlefield running for their lives. That's the way praise works. Praise is a shield that goes before you. When you praise God, the shield goes up. When you complain and doubt, the shield comes down. Every time you face a challenge, you need to say words of praise. Every time trouble surrounds you on all sides, you need to sing songs of praise. God is your shield and defender when praise fills your heart and mind. When you praise God, your shield goes up and the battle is the Lord's. So take up your positions, stand firm, sing praises, and see the deliverance of the Lord. If I really want to be positive, nobody can stop me! I don't get what I want. I get what I expect.